Fantastic central location and stunning lake views. 2 bedroom apartment (approx 65sq.m). Ideal for skiing and summer holidays - 3 minutes walk to City Xpress ski lift and 5 minutes walk to the centre of Zell am See. Spacious balcony with room to enjoy meals and relax has wonderful panoramic view over the lake. Recently re-furbished and in a peaceful location with parking right outside the apartment. Bathroom with shower, wc, bidet, washing machine. Spacious living room with corner dining table for 6. Double sofa bed. Large window with views onto lake. Modern flat screen TV, cable, DVD player and stereo. Wi-Fi included. Kitchen with cooker, 4 plate hob, fridge freezer, coffee machine, microwave. 300 metres to the ski lift. Cellar in the apartment for storing boots and skis/boards. Ski bus stop is less than 5 mins walk from the apartment, buses to the glacier skiing at Kaprun leave every 20 minutes. There are also many other ski resorts just a short drive by car, including Saalbach, Hinterglem and Maria alm which are all covered by the Salzburg area lift pass. There are two 18 hole championship golf courses just five minutes away by car or 10 minutes on the bus. Notes on accommodation: Car parking right outside the apartment block. Outside: Spacious balcony area with table and seating. Wonderful views of the lake and surrounding area. A fantastic place to enjoy a family meal, a few cold beers, a book or a glass of wine! Utility Room: Storage area in cellar for ski equipment, bikes or other items. Cleaning / Towels / Linen / Maid service: Bed linen and towel packs are hired (11 Euros/person) at local agency when collecting keys. Apartment cleaning costs 60 Euros, paid for when collecting keys. Apartment is cleaned before guest arrival and after guests leave. Other: Entrance hallway with shoe storage area. Not suitable for pets. Great location and wonderful view. Warm and cosy apartment. Ideal apartment for the slopes in Zell. Property clean and tidy and ideally located. Could just do with a few more glasses and heating in the lounge needs fixing. Not enough to put anyone off as it's ideal for the price. Suits family of 4. 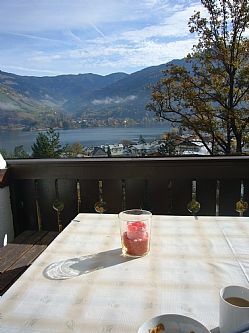 The flat has a great view and being just up from Zell Am See is in a good location. All the basic things like shower, cooker, washing machine worked well which is important when it's a family holiday. There's loads to do in the area too, all within easy reach of the flat. We had a couple of minor issues but the owners were great about getting these sorted out. Perfect for a family with two childeren. The apartment is in an excellent central location for all the facilities and entertainment in Zell am See. We would recommend both the property and the location. The listing description accurately describes both the apartment and location. As expected, the property was clean, well maintained and with all the facilities. The owner provided a list of local sites, English language DVDs and books. Zell am See has many activities for a family with young children. We would especially recommend the evening light/water shows, swimming in the lake, the cable car up Schmittenhoehe and boat trips across the lake. As you'd expect in Austria, food and restaurants are of a very high standard with a nice "buzz" in the evening, especially on Wednesday nights. Slightly further afield, the three gorges/cave are good value for money and the drive over Grossglockner Hochalpinestrasses is a must. For the more active, cable car assisted hiking and mountain biking are easily accessible from Zell am See. Die Wohnung war voll ausgestattet. Der Ausblick vom großen Balkon sehr schön. Getrübt wurde dies durch die sehr dunklen Schlafzimmer im hinteren Bereich. Nicht akzeptabel war der Schimmel in der Dusche und Decke im Badezimmer. Wir haben vor Ort darum gebeten die Dusche zu reinigen und den Schimmel zu entfernen. Dies wurde uns versprochen aber nicht gemacht. Die Wohnung müsste wieder renoviert werden. Was auch unangenehm auffiel war der modrige Essengeruch im Flur. Zell am See is a great place all year round for a walking or biking holiday. Bikes can be hired in the town and there is cellar storage for bikes. 5 minute walk to Lake Zell. Closest airport to Zell am See is in Salzburg and there are regular, direct trains from Salzburg to Zell am See. To get to Salzburg train station, take the number 2 bus from the airport. Car hire is available from Salzburg airport and it is around a 1 hour drive to Zell am See. Munich airport is a 2.5 to 3 hour drive from Zell am See, trains also connect Zell am See to Munich. Zell am See is a charming Austrian town that has all the necessary amenities, such as good restaurants and bars, banks, shops and a pharmacy. There is a supermarket 5 minutes walk from the apartment. The tourist office is located in the centre of town and provides useful information on regional and local activities. The train station is a 10 minute walk from the apartment and taxis are also available from the station. Booking Notes: £200 deposit required to secure a booking, retained as a deposit for damage/lost keys etc, refunded to your bank account at the end of your stay should no damage occur. Rental payment to be paid 6 weeks before arrival (can also pay in Euros to our Austrian account). On arrival keys are collected from local agency office and following fees are paid to the local agency: Towel/linen packs (optional) - €12 per person Cleaning - €60 Tourist tax - €1.10 per adult guest per day Changeover Day: Saturday during ski season and July/August. Flexible at other times, please contact us for more details. Notes on prices: The prices above are in UK pounds, we can also accept Euros. During the ski season and July & August we can only offer weekly lets with Saturday as the changeover day. We can be flexible with this at other times of the year, please get in touch.